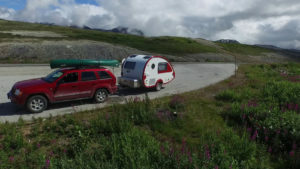 July 28, 2015 – Chilkat Pass, Haines Highway (YT, BC, AK) – The road out to Haines on the coast rises through the coastal mountains through 3510′ high Chilkat Pass. On the way to Haines the rain was so heavy that I decided to pull off and take a nap. 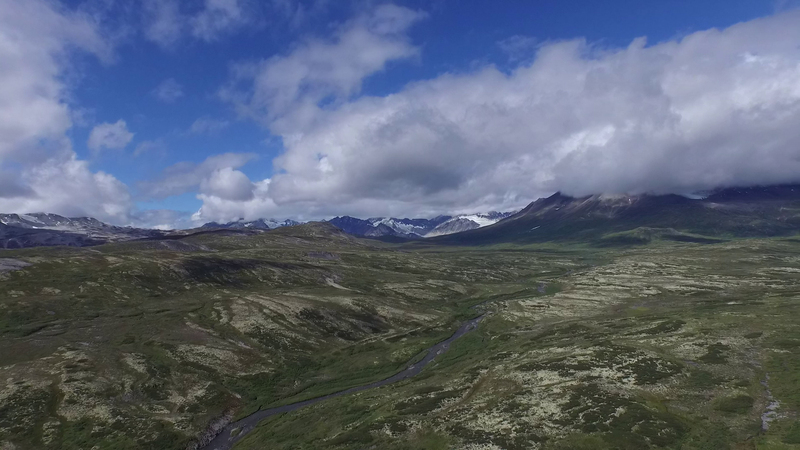 On the way back I had broken clouds and a bit of blue sky, and got the drone up in the air. 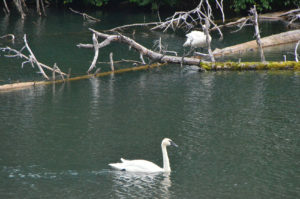 Near the US border I spotted a pair of Trumpter Swans and pulled over to watch them for a while. The Haines Highway is a spur that leads from the Alaska Highway to the town of Haines on the coast. The road turns off at Haines Junction in Yukon Canada, about 150 miles each way, about 45 miles of this road is in Alaska, while the rest is in Yukon and BC. The Chilkat Pass is about 3510′ high and about 59 miles from Haines (not Chilkoot, that’s near Skagway). The pass itself is on the British Columbia stretch of the road. The pass is a wide alpine tundra area, and the plants and lichens are all quite low and vary from dark green to light yellow. On the way to Haines I was in some torrential rains, and I knew that this should be a scenic drive, so I stubbornly pulled over to wait things out. I ended up spending a couple of hours napping with the rain pounding on the trailer. It reminded me of why I chose this option for my home away from home. Snug and secure, I made a light lunch too. In between squalls I headed back out on the road and was treated to a very dramatic landscape. The air and land both washed clean, water flowing in the streams. The air swirled with clouds, some wispy and light others purple and threatening. I got a few pictures before things turned wet again, and I headed on. About 40 miles from Haines is the US border station, and entrance was easy and the short encounter pleasant. Just around the corner was a small lake along side the road and a pair of trumpeter swans. Being white they are pretty easy to spot so I pulled off onto the shoulder early. I walked up and watched them for a while, taking some nice pictures. The drive back through the pass on my way out wasn’t the bright blue sky of postcards, but the broken clouds painted the landscape with sun and shadow and made every photo distinct. I put the drone up and got some aerial shots. 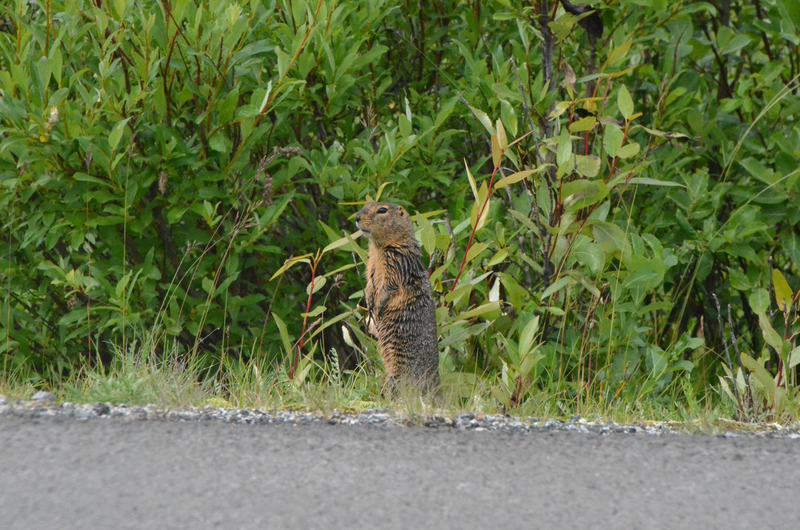 There were lots of ground squirrels along this road, and really quick. They would be alongside the road and run across at the last moment. I’m sure this is a constant food source for the young coyotes and other scavengers. 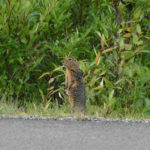 I slowed several times to try to get a photo, but they usually would disappear. But one of them actually stood by while I watched out the drivers window with the camera and I was able to get a good photo as he stretched tall to see further. New road surface washed clean.